As more and more of our daily tasks involve the use of a computer, learning how to type effectively is an ability that anyone could take advantage from. Improving your typing speed will most surely reduce the amount of time you take to complete certain assignments on your Windows PC. For this reason, dozens of websites and desktop applications were created to help you improve your typing skills. All you need is an efficient keyboard and you can immediately start testing and enhancing your typing speed and accuracy. There are many Windows users in the world who find it difficult to type correctly and quickly on their computers. If you're this type of user, then this article is perfect for you. 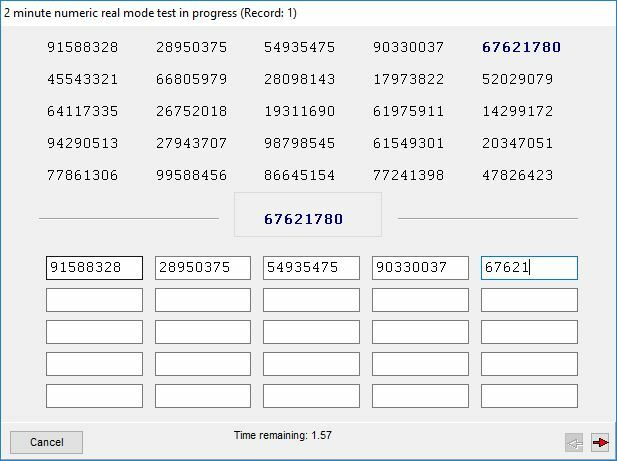 The following apps will include tests and fun activities that will help you type faster and accurately on your Windows computer. Combine various types of activities to keep yourself from losing interest in practicing your typing skills. The learning experience should include a mix of play and work to keep you motivated into improving your typing skills. You might ask yourself "What is a good typing speed?". An average computer user can type between 38 and 40 words per minute. Professional PC users have the ability to type a lot faster - more than 65 words per minute. There are many Windows programs that are specialized into calculating and revealing your typing speed. 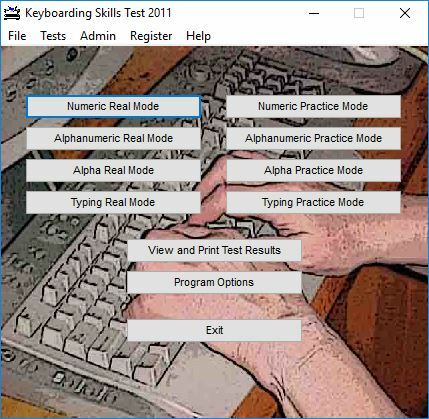 A good example comes from Keyboarding Skills Test. Besides giving you access to information about your typing speed, this application also provides you with a detailed report based on your accuracy level. Launch the program on your PC. The app lets you choose between multiple test profiles. Select the one you want and enter your first and last name. Complete the given test before you run out of time. Once the timer hits zero, the app will provide you with a detailed report based on your test results. You can print the report if necessary. Optional: If you want, you can configure the test settings according to your needs. Go to the main menu of the app -> Program Options and alter the settings. 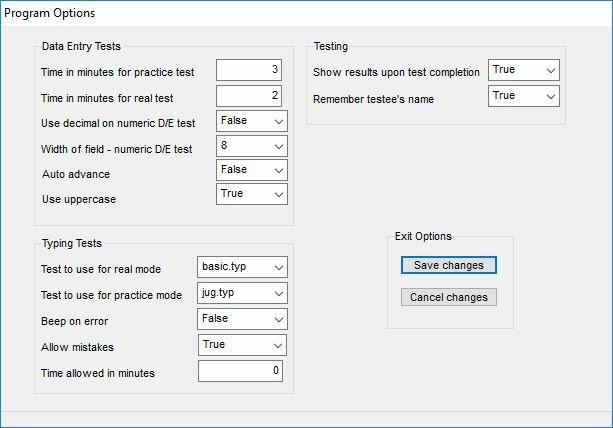 You can choose the preferred interval of time for your tests (it can be between 0 and 30 minutes; so, it doesn't offer keystrokes per hour tests), disable the "Allow Mistakes" option, enable sound notifications for typing errors, etc. Once you familiarize yourself with your keyboard, the first trick you need to try out is to only look at your screen and avoid eye contact with your keyboard. After a little practice, you will reduce the amount of spelling errors and type faster without looking at the keyboard. Other helpful typing tips for beginners include: arrange your fingers properly (for example, use one of your thumbs to hit the Space key; the app is filled with info on how to type faster without looking at the keyboard), practice frequently, etc. Another thing that might help would be to use a specialized app that features exercises to improve typing speed. A good example comes from TypeFaster Typing Tutor. After using this program for several practice sessions, you will be able to increase typing speed from 50 to 100 wpm (words per minute). Launch the app on your PC. Select the preferred test options and configure the program's settings according to your needs. A sequence of characters will be displayed on the screen, and your objective is to type them as fast as you can. The app also displays a virtual keyboard under the chars sequence. Click the "View Your Progress" button to check out your evolution. Launch the app on your computer. Click the "Games" button from the right side of the screen. Choose one of the speed typing games from the Games panel. Configure the gameplay settings according to your needs and click the "Start" button. The app will provide you with gameplay instructions for type practice and teach you how to type faster in games. Play these games to learn how to type faster. I played the Bubbles type race game. 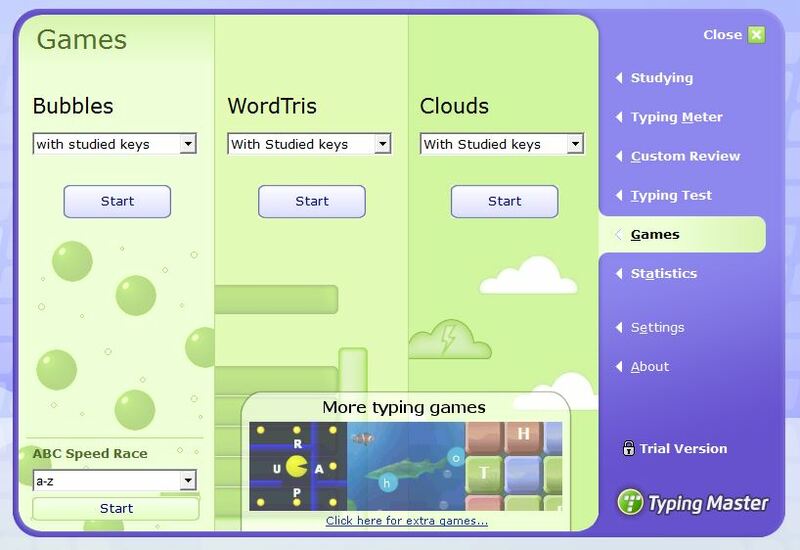 You can also find various fun typing games that can be played directly from your web browser. In most typing racing games, your objective is to race against time and other users by typing certain words. By playing some of these online games will surely improve your average typing speed. Clearly, there are dozens of available solutions for learning how to type faster on your Windows PC. As I said before, try combining fun typing games with your practice to make your learning process more entertaining and less boring or repetitive. After a few practice sessions, you will definitely see the improvements in your average wpm typing speed and accuracy levels.